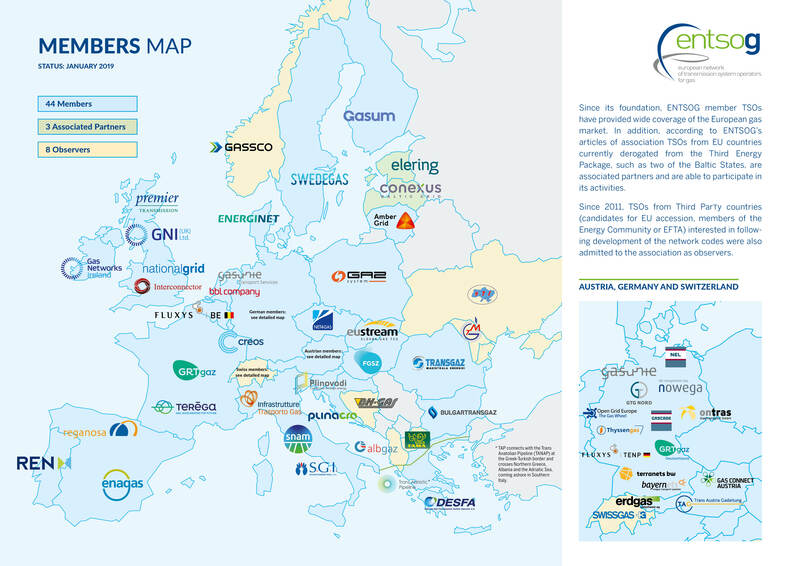 Since its foundation, ENTSOG Member TSOs have provided wide coverage of the European gas market. In addition, ENTSOG's Articles of Association were modified in December 2010 to admit TSOs from EU countries currently derogated from the Third Energy Package, such as the Baltic States, as Associated Partners. This allowed for participation in ENTSOG activities. In February 2011, TSOs from Third Party countries (candidates for EU accession, members of the Energy Community or EFTA) interested in following development of the network codes were also admitted to the Association as Observers. 44 TSO Members, 3 Associated Partners and 8 Observers. Bulgaria Bulgartransgaz EAD 66. Pancho Vladigerov Blvd. Hungary FGSZ Natural Gas Transmission Private Company Limited By Shares Tanácsház u.5.